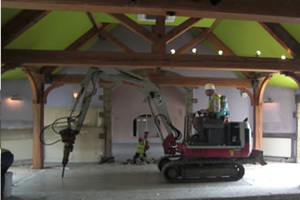 With 30 years of experience under our belt, in the Clitheroe and North West of Yorkshire, we are well equipped to work on both large and small groundwork projects. Whether it be residential or commercial, we have the expertise to plan and deliver quality projects from the ground up. 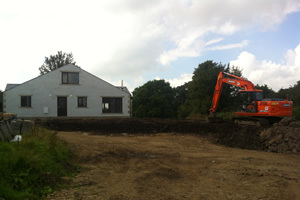 Recent projects even include groundwork in the countryside; we built the new bike trails in Gisburn Forest. In all, the team created an impressive 8km of red trail and 4km of blue trail, for local cyclists. Here at John Moore & Sons we offer the convenience of project management and construction, all under one roof. Rather than working with multiple companies for a project, clients have the luxury of working with a team who can closely collaborate with architects themselves, to plan and design new build projects. With years of new build experience behind us, we have worked on both residential and large commercial projects, including the beautiful Coniston Hotel, situated in the Yorkshire Dales. As well as larger construction work and building from scratch, we are also adept at taking on renovations of all shapes and sizes. As stonework and masonry experts, our portfolio is wide and varied. 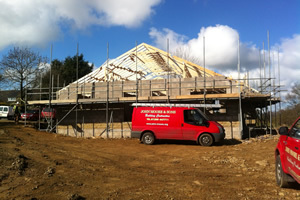 As well as more common building renovations, we have experience in slightly more specialist projects as well. The team have spent time restoring period fixtures and even worked on a Grade II listed bronze war memorial in Slaidburn. We are perhaps best known within the district for our specialism in barn conversions and have worked on a stunning range of properties over the years. For more information on the services we offer as a leading West Yorkshire Building Company or to view our extensive portfolio feel free to give us a call on 01200 447711 or get in touch via Twitter.